It happens, even to the best of racers. You find yourself at the tail end of the fleet. Who knows how you got there – a third row start, a miserable first beat, a big shift, a boat handling disaster. I will not dwell on the ways to fall behind; at that, it seems, we are all uniquely qualified. So, you’re back in the pack. Now what? 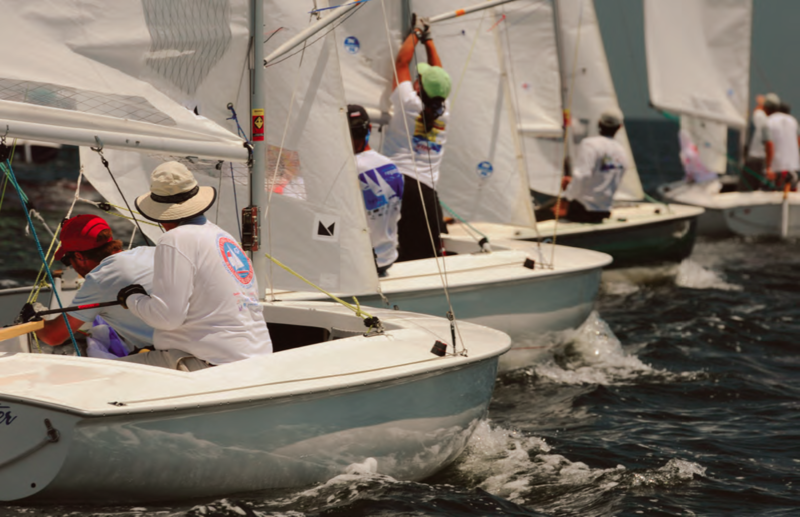 Before getting into details, recognize that in any regatta or series your worst race is often the most important. One astronomical score can shatter an otherwise competitive record. The ability to bring that astronomical finish down to earth is the mark of a champion, and success starts with attitude. How Many Can We Pass? Salvation starts with attitude. When you find yourself at the wrong end of the fleet, don’t get depressed. You are in The Land of Opportunity – there is a whole fleet of boats waiting to be passed! The only way to go is up! Don’t wait for a miracle to save you. Get to work and grind ’em down, one at a time. You’re not going to win this race; that is no longer the goal. Actually, winning is redefined for this race: Winning is passing as many boats as you can. Don’t panic. Settle down and work on boat speed. You will not pass anyone without good speed. Concentrate on speed, and you should be able to knock off a few tail-enders easily. Fast trim is hard work and too often crews lose their energy and effort wanes when you are in the cheap seats. Great skippers can motivate their team to maintain full effort in tough times: “I need your help here if we are ever going to recover.” Trim with a little extra twist to emphasize speed over pointing so you can rocket out to the favored side. Go the right way. In The Land of Opportunity, you must concentrate more on your overall strategy than on immediate tactics with those nearby. Upwind, figure out which side of the course is favored and head that way. Back here it is hard to sail the middle; all that gets you is traffic and bad air. You must pick a side. Do it carefully – you can’t afford another mistake. If you are not sure which way to go (maybe that’s how you landed in the Land of Opportunity in the first place), look to the leaders for guidance. The leaders are probably doing what is right – they’re in the lead – QED. Others will gamble against the odds in hopes of passing the leaders. Your goal is pass the gamblers. On reaches you can save distance by sailing the rhumb line while letting others waste distance On reaches you can save distance by sailing the rhumb line while letting others waste distance sailing high and then low. Avoid luffing duels, set up to take advantage of current, plan well ahead for the inside position at roundings and, above all, keep sailing fast. Leeward legs offer an opportunity to attack those ahead. For all you need to know about Running Strategy and Tactics, pull out your North U. Tactics book or disc. There are real opportunities here. And sail fast. Changing conditions create opportunity for big gains. Look for changes in wind and current that will give you the chance to make up ground. (Maybe the previous change was what sent you to The Land of Opportunity…) Keep your head up and look for changing conditions. Sometimes boats ahead are slow to respond to changing conditions, as they tend to stick with what has worked for them so far. With little to lose, you can leverage yourself to make the most of changing conditions. Hopefully you’ve fallen behind early, so you have plenty of time to catch up. Play the shifts and work the favored side; and keep sailing fast. 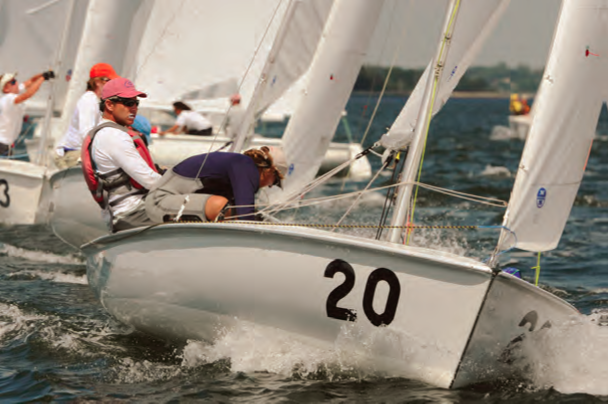 Position yourself carefully to pick up a few boats at each mark rounding. Look ahead for changing conditions and be ready to respond. Sometimes, late in a race you may need to gamble, split with the fleet, and hope to get lucky. But don’t panic if you fall behind early. Don’t count on luck. Get to work. Every boat you pass is worth a point, and it is easier to move from 15th to 5th than it is from 5th to first. When you find yourself in The Land of Opportunity, keep cool, sail fast, go the right way, and avoid confrontations. You can reach The Promised Land. Bill Gladstone is the Director of North U. For more information about the North U. Seminar Tour (the featured seminar for 2014 is Boatspeed), webinars, books, DVDs and North Sails Gear, visit northu.com.